It's about time. After months of being boxed up in a crate, and five more months of sitting around after an awesome unboxing, NASA's Robonaut 2 helper droid has finally been powered up. Robonaut 2, which also goes by "R2" or "the automaton astronaut," has been on-board the International Space Station since February (when it was delivered by space shuttle Discovery on its final mission) and out of its crate since March, but today is the first time ISS astronauts have actually redirected power from the space station towards powering R2. "He has been groveling in his stowage location over here in the lab," ISS astronaut Mike Fossum of NASA, pictured here, told Mission Control today. "The complaint's mainly been that he wants to get out and get to work. Well, today is finally the day." "Sure wish I could move my head and look around," tweeted R2, which won't be put through the paces of moving its various appendages until September 1, when the droid will finally be commanded to move its fingers, hands, and arms. It is at that time that NASA plans on releasing a high-quality video of the highly dextrous droid in full effect. 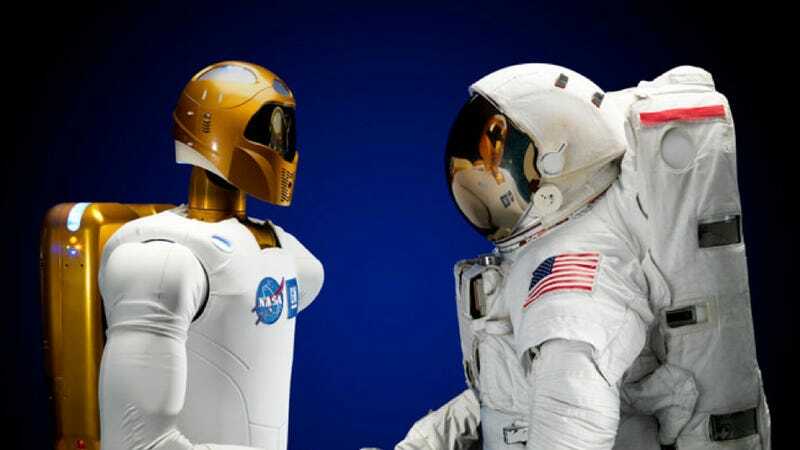 R2 is the very first humanoid robot in space, and is being tested for its potential use as a helpful companion on future NASA missions. While R2 is currently designed to stay inside the space station at all times (the droid in its current configuration is all torso and arms, and must be docked at the waist to a fixed pedestal), a pair of legs are currently being designed and should be launched in 2013. Future, upgraded versions of R2 might even venture out with human crew members on spacewalks.